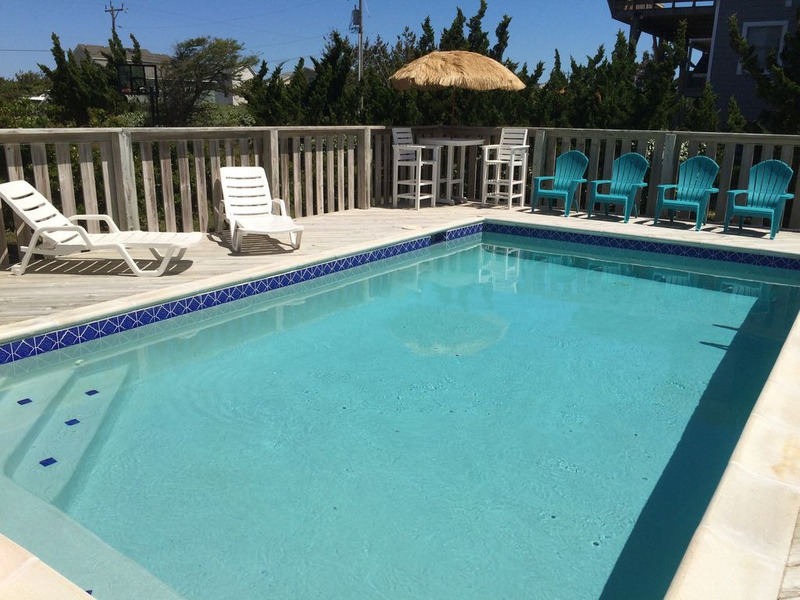 S. Nags Head Semi-Oceanfront: Large Pool, Hot Tub, NEW KITCHEN-2018! Welcome to Nags Head Haven (NHH). Upgraded for the 2019 season, you've just found the perfect home for your beach vacation. NHH enjoys a majestic semi ocean-front location providing easy access to the beach coupled with the privacy and space that only a double lot can afford. 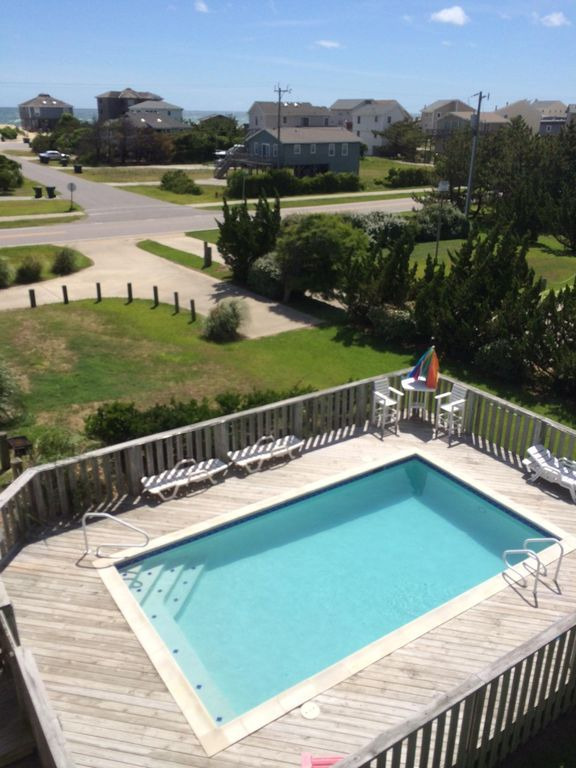 Complete ocean and sunrise views to the east and quiet park and sound views facing west. Even locals marvel at the views presented from the upper living area. 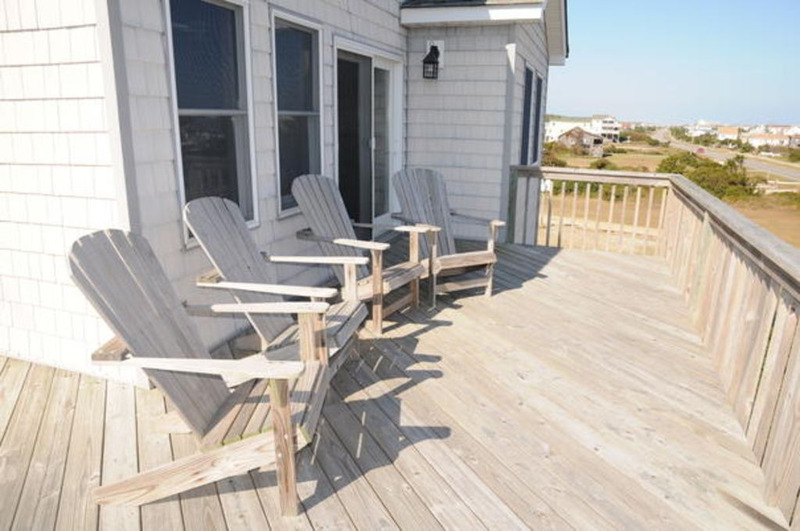 From morning coffee on the front deck to evening/sunset hot tubbing on the rear deck, this house has it all. The complete kitchen remodel for 2019 will please the most discerning of cooks. This vacation paradise features a large outdoor swimming pool*, 6-person hot tub, large HDTV in living area and six additional flat-screen TV's throughout the house, game room with foosball table and vintage arcade game (Ms. Pac-man Cocktail Arcade Table), outdoor basketball area, high-speed wireless internet access, free long-distance telephone calls, 10-car parking area. Easy access is provided via a keyless entry system, so there is no need to stand in line at a rental agency on arrival and departure. Sunday turnover dates (during the season) have been selected to help alleviate the dreaded traffic snarl encountered during the peak saturday times. You can vacation with ease knowing that local maintenance and service personnel are available for any unusual circumstances or emergency situations, and I personally work hard to ensure the highest level of customer satisfaction. NHH provides over 3000 square feet of living space with THREE King bedrooms, each with en-suite full bathrooms. 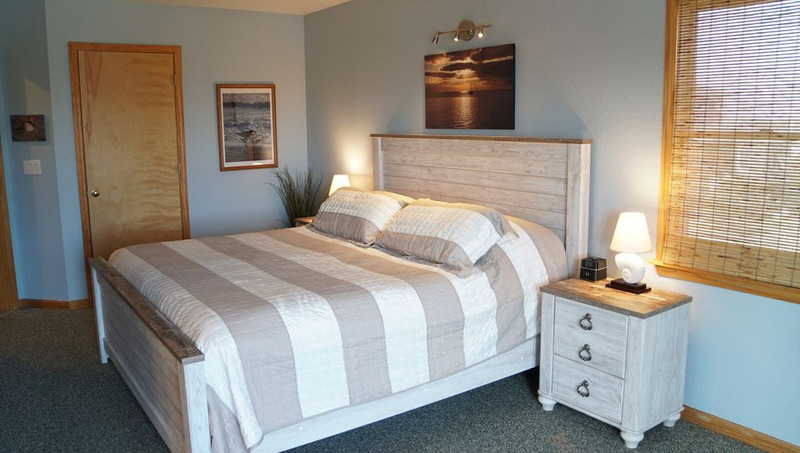 The fourth bedroom has a Queen bed and Twin Bed. 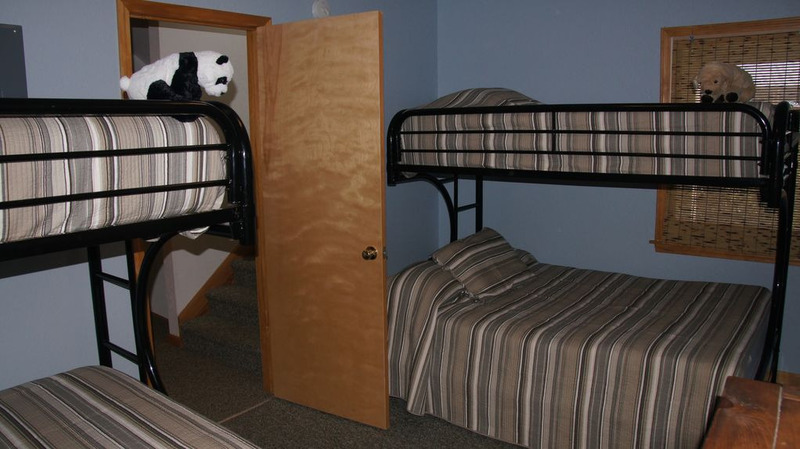 The fifth bedroom/kid's room is furnished with two pyramid bunk beds (two full beds below and two twin beds above.) 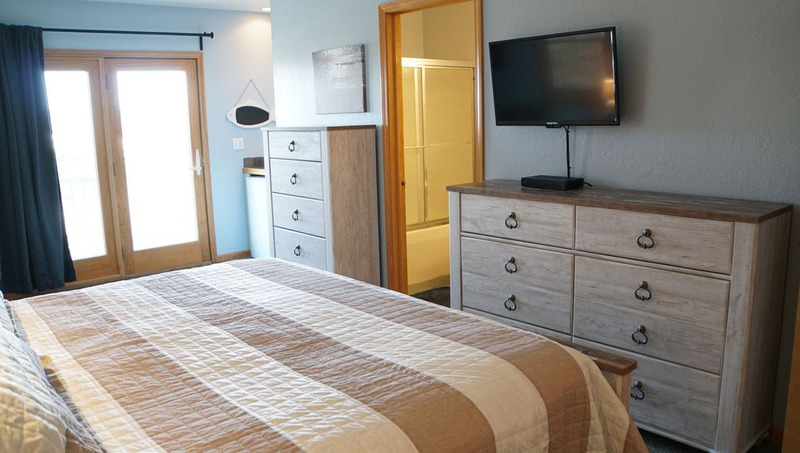 Unlike many beach houses that squeeze a king bed into a small room, each of NHH's master bedrooms is large enough for a king size bed, work desk, and pack 'n play. Two even have their own wet bars. What truly sets NHH apart from the rest is it's location. 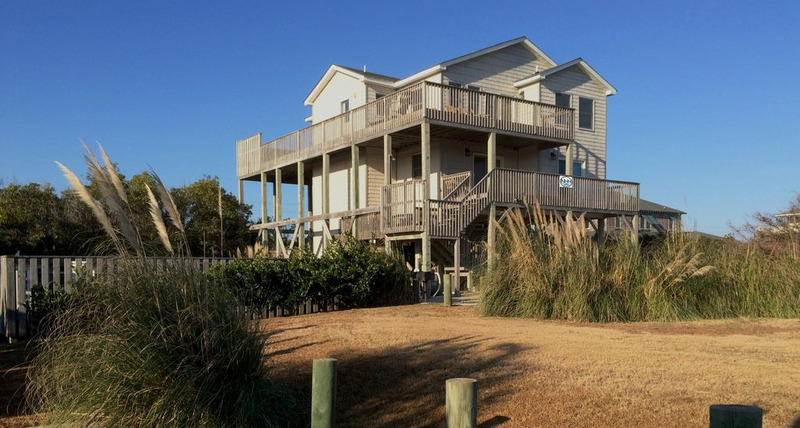 Homes on Mile Post 18 back up to the Cape Hatteras National Park, so privacy abounds. Enjoy the peace and quiet of the National Park behind, with incredibly easy beach access only 150 yards (450 feet) straight ahead. 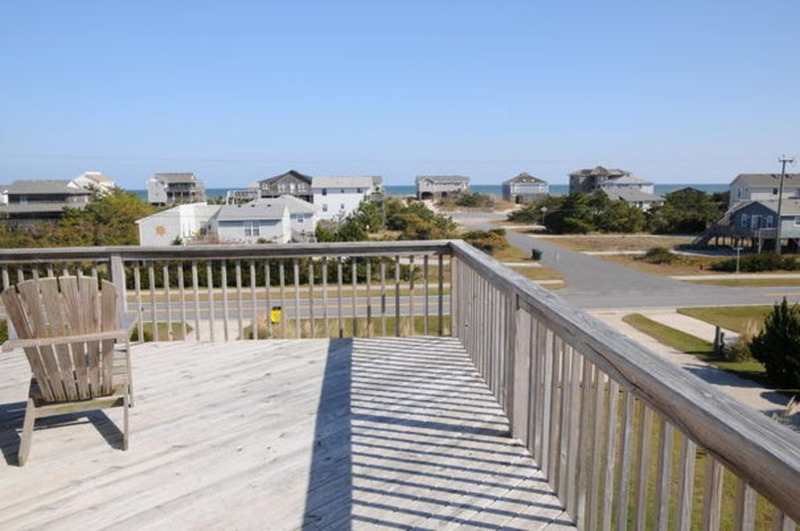 The shops at Nags Head, including Food Lion and The Fresh Market, are a short 6 minutes (3 1/2 miles) away, yet your vacation fun isn't interrupted with a busy highway and urban noise. 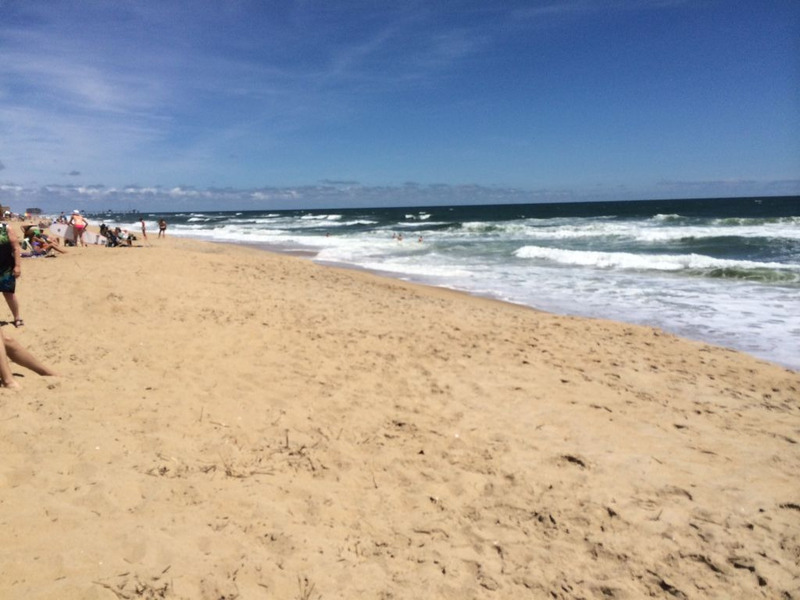 Best of all, the beaches of South Nags Head are some of the nicest in the area. 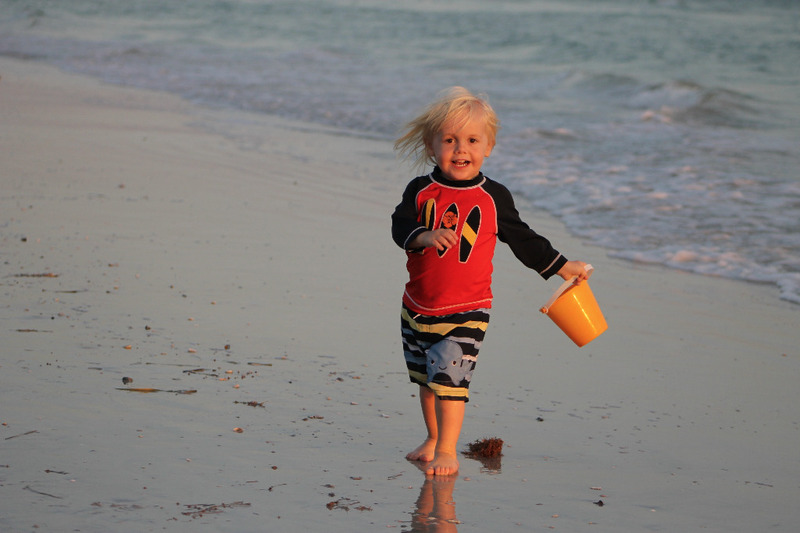 Our beach nourishment program ensures a great beach experience, and our beach remains uncrowded and family friendly. NHH's layout works for families of all sizes, sleeping up to 15. 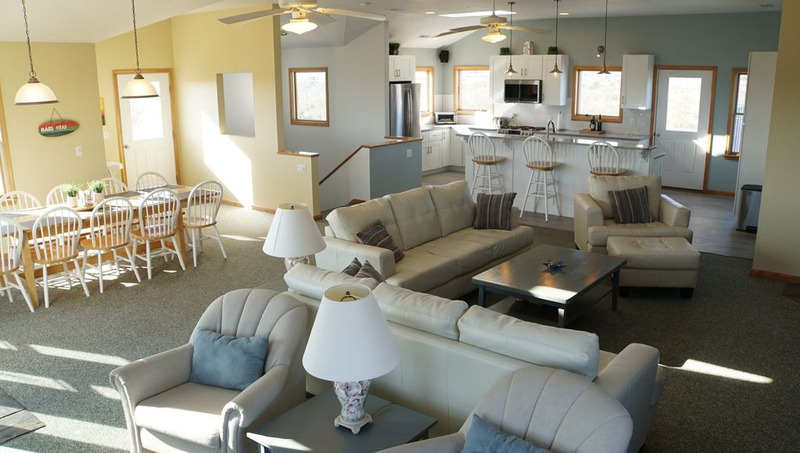 The first level features a recreation room with TV, cocktail arcade game (Ms. Pac-man/Galaga) and foosball table, full refrigerator, microwave, wet bar, half bathroom, and a king master suite with full bathroom. 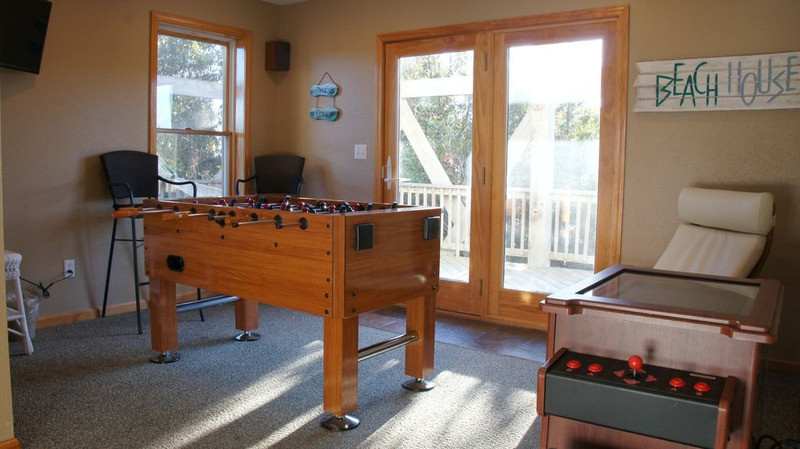 The game room and bedroom have access to the massive lower deck surrounding the house. Enjoy a swing in the hammock, or a splash in the over-sized swimming pool. There is a built-in BBQ as well. On the second level you will find four more bedrooms. 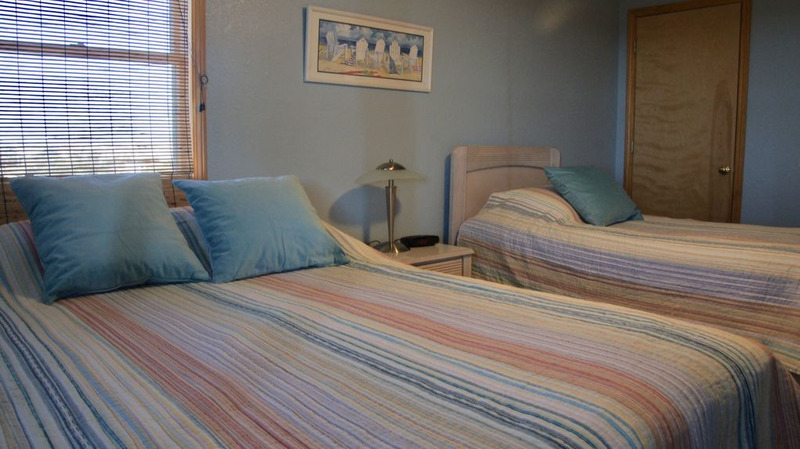 Two master bedrooms with king beds and full bathrooms. One room with a queen and twin bed, and a kid's room with 2 pyramid bunk beds (two full on lower and two twin on top). 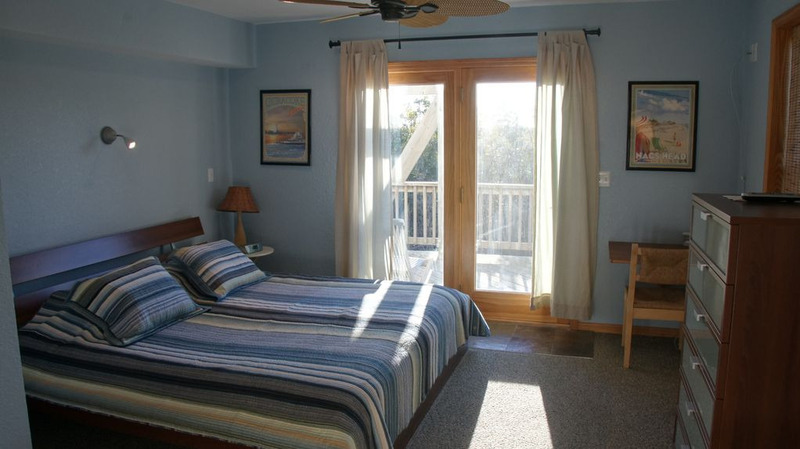 There is a covered deck facing the ocean, with access from both master bedrooms. Another great amenity is a deck area overlooking the swimming pool. This spot allows guests to view and enjoy the pool area without having to go downstairs. Perfect grandchild viewing! When you make it to the third level, you will know why I fell in love with this house. The third level features 360 degree views of the ocean/national park/sunrise/sunset. Add in a few skylights, and you've found the closest thing to being outdoors. The brand new kitchen is complete with quartz counter tops, wood-like porcelain tile, a massive refrigerator and ice maker, chef's gas stove top, electric convection oven, microwave, drip coffee maker, k-cup coffee maker, toaster oven, and blender, with a breakfast bar seating 4 next to an adjoining dining area which seats 10-12. The kitchen, dining area, and living room all feature tall ceilings throughout. 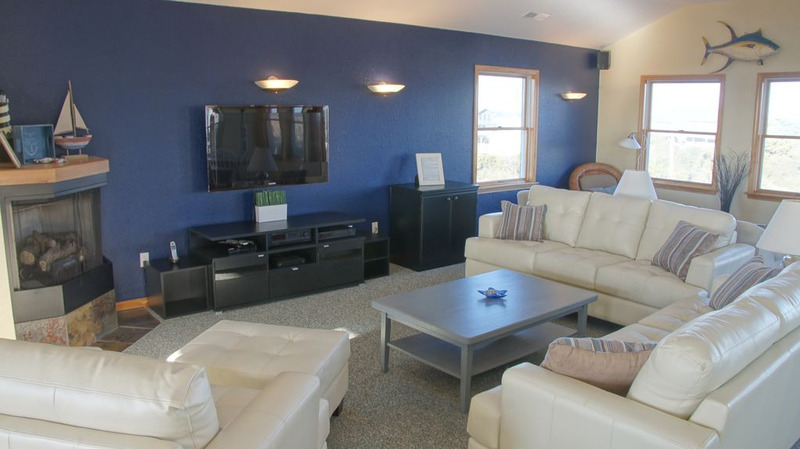 You can enjoy the big screen HDTV while sitting in front of a warm gas fireplace on a cool evening*. The living room opens to a wrap-around deck featuring ocean views and park/sound views. 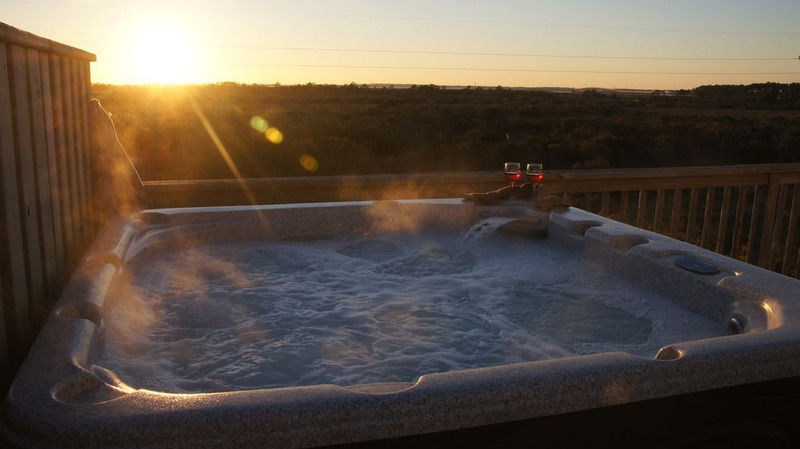 The 6-person hot tub, cleverly situated on the upper-rear deck, allows for sunset soaking. In addition to the main sitting area, there is a second area complete with a wet-bar and mini fridge to host pre-dinner cocktails, keeping family out of the kitchen. Experience the vacation of a lifetime creating timeless memories; whiling away the hours at the beach or in your private pool or hot tub, enjoying a cool drink on the deck marveling at the ocean views, or visiting the surrounding area where within a short walk or drive you will find fine dining and the favorite restaurants of the locals. There are outlets stores, boutiques, golf courses, miniature golf, hang gliding, the Wright Brothers Memorial and the Lost Colony in Manteo. Come and enjoy...you will want to return again and again. Brand new Chef Kitchen installed in 2017, loads of reviews available at Homeaway.com/3896003, save big dollars by booking here with owner! CHECK-IN TIME is AFTER 4 P.M. AND CHECKOUT is 10 A.M. NO Early Check-in or Late Checkout. PETS - PETS are not permitted in rental unit under any conditions. 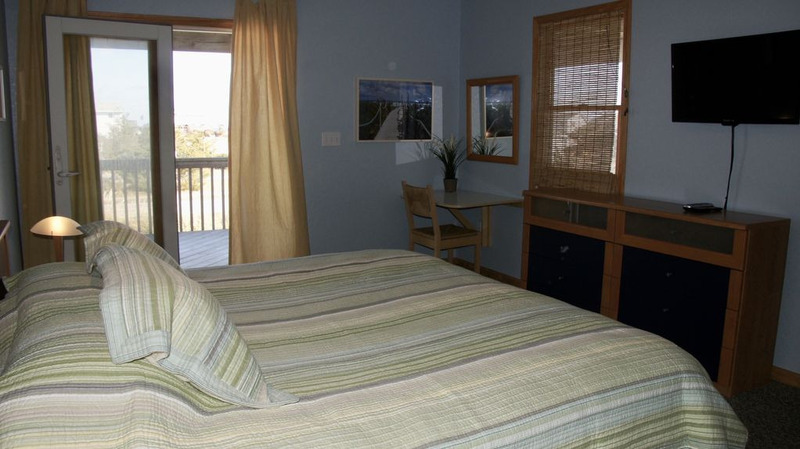 DAMAGE/RESERVATION DEPOSIT - Included with every reservation is a Partial Damage Fee. We realize most of our guests are responsible people; however accidents happen. The Partial Damage Fee does not relieve you of your obligation to maintain the property. To report any accidental damages during your occupancy please notify me immediately by email, text, or by calling the service number you will receive on arrival. We will then personally assess damage. • Damage is done to unit or its contents, beyond normal wear and tear. • Debris, rubbish and discards are not placed in trash cans/bags, and dishes are not cleaned and put away. • Any charges accrued during the stay are not paid prior to departure. • Linens are lost or damaged. PAYMENT – An advance payment/deposit equal to 50% of the rental charges is required to reserve the home. The final payment is due 45 days before arrival. The final payment will complete the rent requirement. Please make payments via electronic check or credit card using the HomeAway/VRBO site’s invoice. If you are unable to use the site, you must advise me prior to the 45 day due date. Failure to make a timely rental payment will cause forfeiture of the reservation deposit, and cancellation of the rental reservation. The advance payment is not a damage deposit. CANCELLATIONS – In the event that a reservation has to be cancelled this must be made in writing and received via this system prior to check in. Refunds are available only if the property is re-rented. The tenant is responsible for verifying that the cancellation email has been received. I will make all efforts to re-rent the home. If I am unable to re-rent the property, any and all prepaid rental payments, and taxes due, will be forfeited. If the property is re-rented for full term of the original rental period, Tenant will receive a refund of any prepaid rental payment. If the property is re-rented for only a part of the original rental period, the only refund due to the canceling Tenant are those funds in excess of the original rental rate. If the rental rate has been negotiated to a lower rental rate, tenant is only refunded any amount in excess of the original lease amount. If tenant has purchased the Trip Cancellation Insurance, premium may be non-refundable, based on the rules of the insurance provider. Refunds will be payable to the Tenant within 30 days after the subsequent re-rent payment has cleared our accounts. Tenant will be entitled to reimbursement of any fees paid to Agent for goods, services, or benefits procured by the Agent from third-parties for the benefit of Tenant that have not been paid out prior to receiving the written notice of cancellation. TRIP CANCELLATION INSURANCE IS HIGHLY RECOMMENDED TO PROTECT AGAINST UNEXPECTED EVENTS. Cancellation or early departure does not warrant any refund of rent other then stipulated above. TRANSFERS - Transfers may be made from one week to another. Requests for transfers must be made in writing via the reservation system. Transfers that occur from a higher rental rate season to a lower rental rate season will remain at the charge of the higher rental rate season. Transfers from a lower rental rate season to a higher rental rate season will be charged the higher rental rate. There is no transfer fee, but payment plus tax due must be made before we can transfer your reservation. Transfers can only be made up to 30 days prior to arrival. MAXIMUM OCCUPANCY – The maximum number of guests is limited to the number of occupants listed in the reservation request, to a maximum of fifteen (15) persons. Exceeding the authorized occupancy rate will result in eviction and/or additional charges. INCLUSIVE FEES – Rates include a one-time cleaning fee. 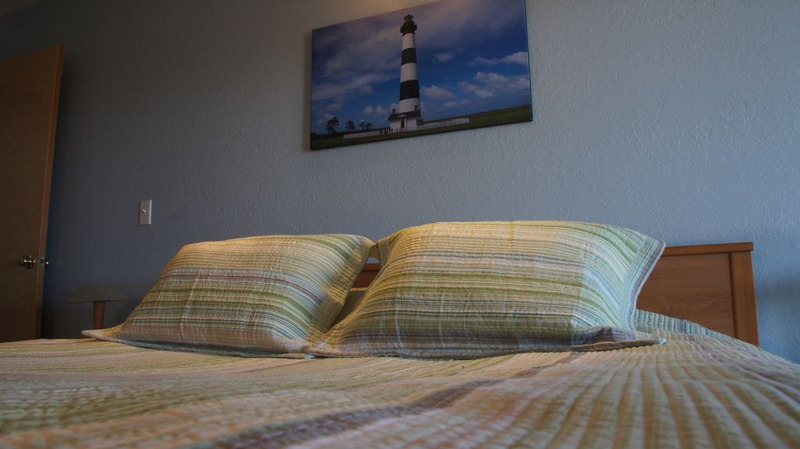 NO DAILY HOUSEKEEPING SERVICE – Bed linens are included in the unit, however towel sets are provided on a $6/set basis. Daily maid service is not included in the rental rate. Maid service is available at an additional rate. 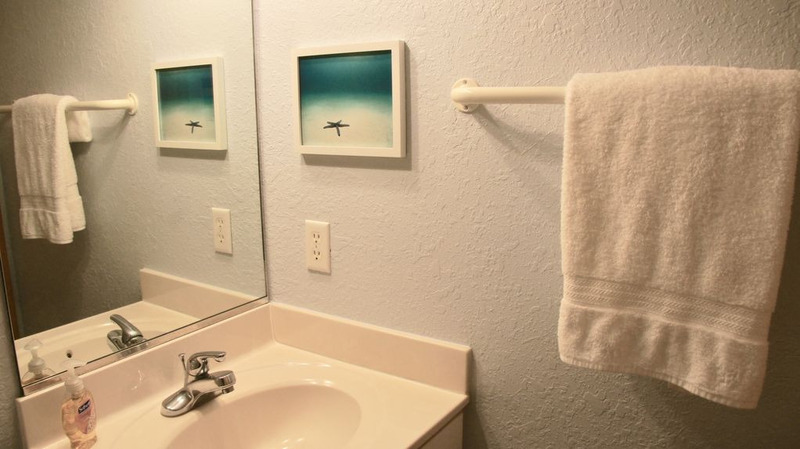 We do not permit bath towels or linens to be taken from the units. RATE CHANGES – Rates subject to change without notice. Rates are not guaranteed until rental deposit has been received. FALSIFIED RESERVATIONS – Any reservation obtained under false pretense will be subject to forfeiture of advance payment, deposit and/or rental money, and the party will not be permitted to check in. STORM POLICY – HURRICANE OR STORM POLICY – No refunds will be given unless travel insurance has been purchased, and the stipulations are met. Claims are filed directly with the travel insurance provider. TRIP CANCELLATION INSURANCE IS HIGHLY RECOMMENDED TO PROTECT AGAINST UNEXPECTED EVENTS. In the event of a mandatory/ordered evacuation by the Dare and/or Currituck County Emergency Management Control Group, no rebate will be offered. However, Trip Cancellation Insurance is available as a viable alternative, as it offers additional coverage such as medical emergency, death in the family, as well as storm evacuations. The cost of this insurance is a percentage of the base rent, administrative fee, and taxes and is automatically added and due with your advance rent payment via the HomeAway.VRBO system. If you do not wish to purchase this coverage, you may delete the charge. We strongly urge you to take advantage of this option, as no refunds are offered. GRILLING - Grilling is only permitted on concrete driveways with a minimum distance of 25 feet from the house. No grilling is allowed on decks, porches, wooden walkways, or carports. Upon departure, please dump all the ashes and leave the grill cleaned. A gas grill can be rented at many locations in the area, and be delivered on request. 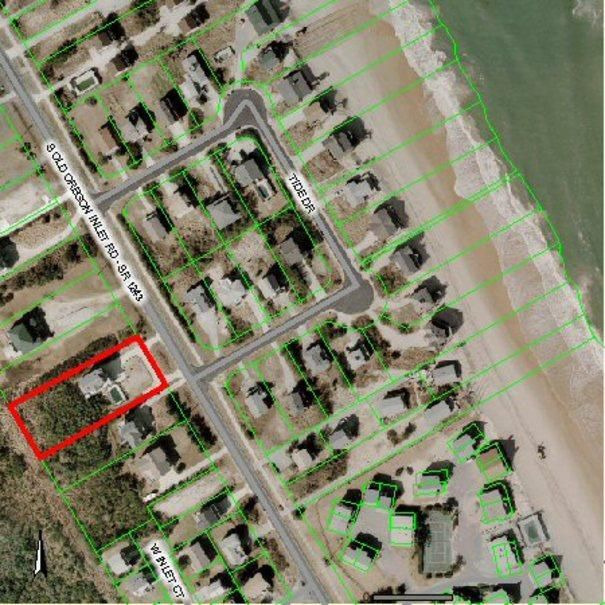 CONSTRUCTION – BEACH NURISHMENT - New home construction and home renovations are abundant throughout the Outer Banks. Unfortunately, we have no control as to when and where construction occurs. No refunds or property transfers will be made. There is a possibility that some areas along the beaches may be involved in beach nourishment projects. There may also be construction projects in progress nearby during your stay. We cannot predict when or where these jobs will begin or how long they will last. Since we have no control over these situations, no compensation or moves to other properties are permitted. 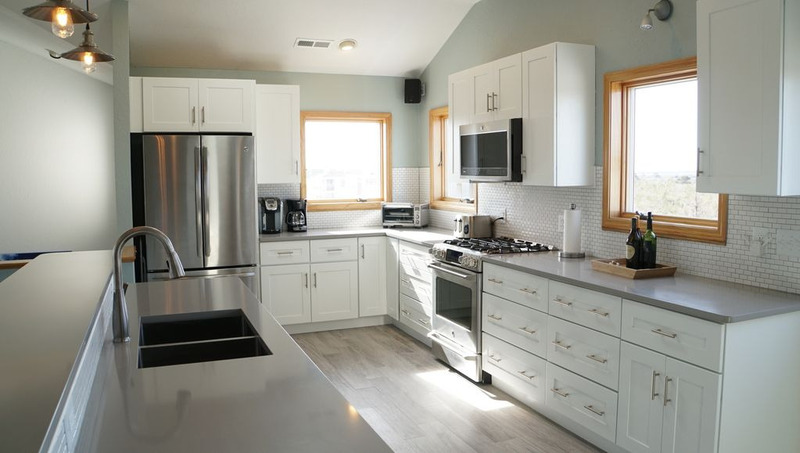 This home is privately owned; the owners are not responsible for any accidents, injuries or illness that occurs while on the premises or its facilities. The Homeowners are not responsible for the loss of personal belongings or valuables of the guest. By accepting this reservation, it is agreed that all guests are expressly assuming the risk of any harm arising from their use of the premises or others whom they invite to use the premise. We had a wonderful time at Nags Head Haven! We had 3 families with 6 adults and 5 kids. There was plenty of room for everyone to have their own space and also great common areas where everyone could comfortably congregate. The walk to the beach was easy and the pool was wonderful! I would highly recommend this home for your next vacation! Nags Head Haven was the perfect venue for my long anticipated reunion with the lovely girls in my family. The common areas were a great fit for the long nights of girl talk, with the bonus of plenty of private places when a one needs their own space. 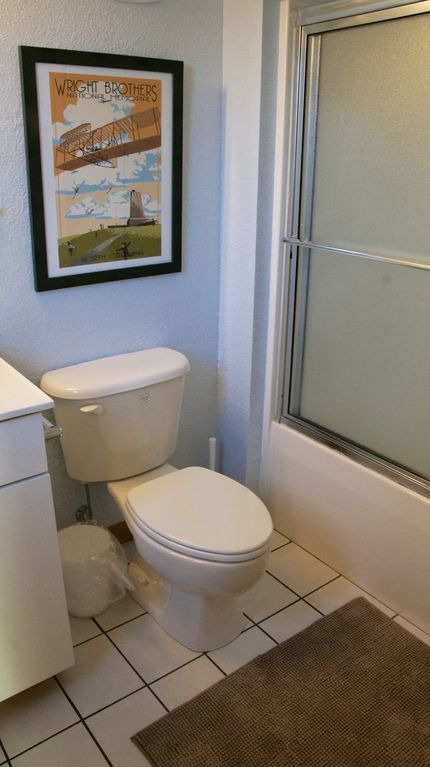 Very clean, stocked with everything you might need providing the comforts of your own home. The location is divine. Close to shopping and restaurants, grocery stores and most of all, the beach! Seth, you have a wonderful home -and then (spoiler alert) there's the surprise gift bag. You get the award for host of the year. Thank you for allowing us to use your home. We rented this for our extended family could all attend a wedding and it was perfect! Clean and spacious with every amenity you need. This house has it all. Comfort, style, and space for all. Great location! Loved the stay at NagsHeadHaven. House is well kept, maintained and stocked. Plenty of room to spread out and get your own alone time if needed. Kitchen and main living area were awesome. Been to OBX many times and this house is at the top of the list for future visits. Saw lots of wildlife in the backyard including deer and a red wolf. June 11 thru June 18 2017 Loved every second. 13 of us (8 adults and 5 children) stayed at this beautiful, well maintained, sparkling clean home in South Nags Head know as Nags Head Haven. Tastefully decorated. Not even a speck of dust. Location is AMAZING ... 3-5 min walk to the beach. Top Level with Open floor plan. Newly remodeled kitchen. ABSOLUTELY GORGEOUS!! New Chef style Gas Stove with electric oven. Huge new refrigerator. Dishwasher. Large deep sinks with hands free faucet. Cabinets/Drawers full of plates, bowls, platters, cooking supplies, spices, utensils and even small kitchen appliances. Comfortable living room furniture (white leather couch, love seat and chair with ottoman). Large screen TV and surround sound. Also Cabinet full of games and puzzles. Dining area with long table with seating for 12. Plus, Island in kitchen with additional seating for 4. Also a wet bar, with smaller refrigerator in living room Updated master bedroom with beautiful furniture! Also we bar with another smaller refrigerator. 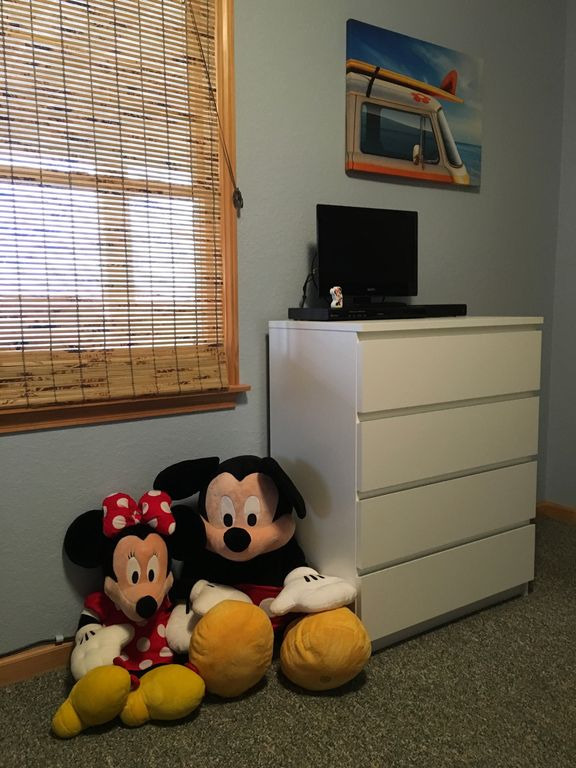 All bedrooms, play room and living room have ceiling fans. ALL BEDS VERY COMFORTABLE!!! 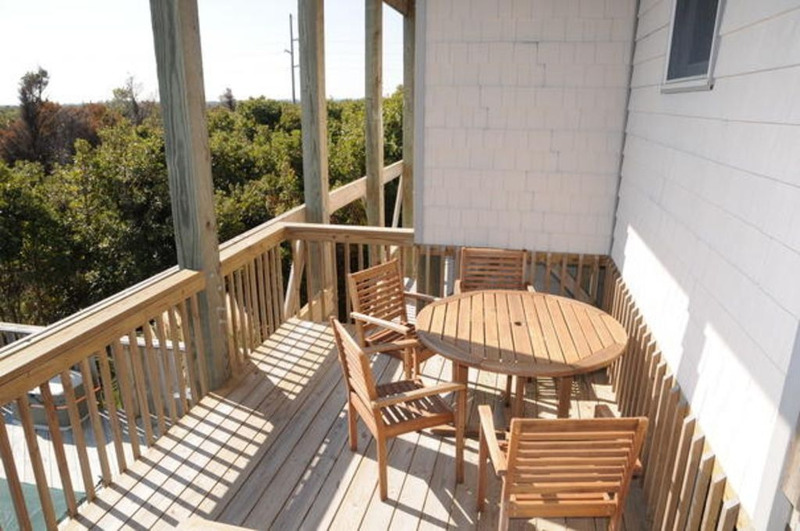 The large decks on all levels with ample seating for watching sunrises, sunsets, relaxing, reading or napping. Large Hot Tub on top deck. The play room on the lower level has a Foosball table, stereo, and PAC-MAN video console with multiple games on it for the kids. Also has a full sized refrigerator. Oh yes, I can't forget the hammock on the lower deck. Outside shower with hot/cold running water used to easily rinse the sand off from a day at the beach. In-ground swimming pool with wrap around deck on second lot. SUPERB!! Several lounge chairs, table with umbrella. Storage Chest with pool toys. Small shed with beach cart, beach chairs, beach umbrellas, boogie/surf boards and inflatable pool toys. New foot pump to keep the basketballs, soccer balls inflated. A few more of the Extra Amenities: Digital clocks with USB charging ports in very room, mesh laundry hampers, suitcase butler to name a few. Thanks a Million Seth the for use of beautiful home on our vacation. Can hardly wait to stay again. We enjoyed our family vacation despite a few cloudy rainy days. 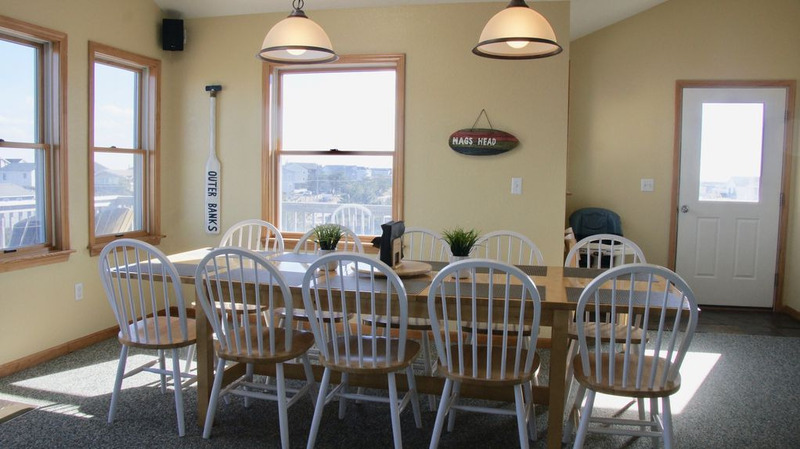 The beach house was very comfortable and had plenty of room for 8 adults and 2 children. The great room and kitchen was where we all hung out when not spending time at the pool and the beach. The views from the great room and the decks on all levels was fantastic. Beach access was a breeze with a short walk and the cart provided by the owner. The well stocked kitchen, the game room room with fooseball and vintage pacman, and the shed with beach chairs, toys, umbrellas, etc were among the nice touches that made this property stand out. Other nice amenities included the hammock for enjoying the breezes, outdoor tables on the decks for enjoying crabs, and a pool that received early sun through the afternoon. Close proximity to the Outer Banks fishing pier was a big plus not only for fishing but for Fishheads located at the head of the pier, which was a very fun place to eat and have a few beers. Overall, this property and the Owner made our stay a great one made for many great memories.